First Shipment of Revolutionary SOLO Electric Vehicles Arrives in North America. Houston, TX, April 12, 2019 --(PR.com)-- Crane Worldwide Logistics, a leading supply chain solutions company, is pleased to announce that they have been selected as carrier of choice by Electrameccanica Vehicles Corporation, a leading designer and manufacturer of electric vehicles. 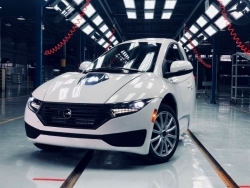 By leveraging Crane Worldwide Logistics, Electrameccanica will be able to seamlessly ship single-passenger SOLO cars from its manufacturing facility in Chongqing, China to Los Angeles, United States and Vancouver, Canada. Electrameccanica is a designer and manufacturer of electric vehicles. The company designed and manufactures the innovative, all-electric SOLO, a single-passenger vehicle developed to revolutionize the way people commute. Intermeccanica, a subsidiary of Electrameccanica, has successfully been building high-end specialty cars for 60 years. For more information, visit www.Electrameccanica.com.